COLORADO SPRINGS, COLORADO — This was supposed to be a week in which Pentagon leaders would “share our thinking and lay out our unified, whole-of-government plan to ensure U.S. leadership” in space. But less than an hour after Acting Defense Secretary Patrick Shanahan uttered those words, It became clear that deep disagreements remain about how to reorganize the U.S. military’s orbital operations. In her own speech here, Air Force Secretary Heather Wilson warned about new plans to launch clouds of inexpensive satellites to augment larger ones that are more capable, yet ostensibly more vulnerable to jamming, cyber attack, or destruction by China and Russia. “Launching hundreds of cheap satellites from the Earth as a supplement for the complex architectures where we provide…will result in failure on America’s worst day,” Wilson said. She did not mention the new Space Development Agency by name, but her target was obvious to most of the thousands of military and commercial space professionals gathered at the annual Space Symposium. A better idea, Wilson said, is using the low-Earth-orbit satellites being developed by the Air Force and through its Space and Missile Systems Center, the service’s satellite and launch buying command. A former defense official pointed to other ways the Pentagon’s space reorganization efforts are duplicative. “It is more than a little ironic that the acting defense secretary is calling for the unification and consolidation while at the same time they are creating multiple more organizations with, apparently, different visions for the future,” a former defense official said. Later Tuesday morning, Gen. John Hyten, the head of U.S. Strategic Command who has been nominated to be vice chairman of the Joint Chiefs, appeared to play diplomat between Shanahan and Wilson. At a briefing with reporters, Hyten said the Space Development Agency and the newly reorganized Space and Missile Systems Center will take risks to move faster in new satellite development. There is a lot at stake this week as Shanahan and other Pentagon officials work to convince Congress, which has the final say about several steps of the proposed reorganization, including the creation of a Space Force, a new branch of the military ordered up by President Trump. Shanahan, Wilson, Hyten, and Joint Chiefs Chairman Gen. Joseph Dunford are scheduled to testify alongside one another at a Thursday Senate Armed Services Committee hearing about the proposals. At the Symposium, Shanahan painted a dark picture of what could happen if America’s satellites are attacked. “The threat is clear: we’re in an era of great power competition, and the next major conflict may be won or lost in space,” Shanahan said during a keynote address. Shanahan said a Space Force — which, if approved by Congress, will be part of the Air Force just like the Marine Corps is part of the Navy — is necessary to defend against new Chinese weapons that could destroy or interfere with U.S. satellites relied on by the military, global financial institutions and ordinary people around the world. He singled out Chinese weapons that could jam U.S. communications, intelligence, and navigation satellites. While there is general agreement about the threat, lawmakers are far from convinced about that the Pentagon’s Space Force is the solution. Some say it undermine U.S. space efforts by adding costly bureaucracy. 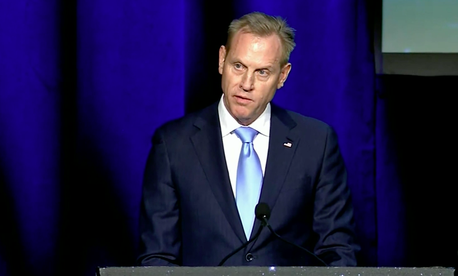 In his speech, Shanahan attempted to connect with ordinary Americans just as much as the space professionals assembled at the annual symposium. His language was rather clear and plain, a contrast to the highly technical remarks that generally prevail here. The acting secretary sought — through his speech and in an interview with Fox News’ Brett Bair that will air this week — to show U.S. citizens just how much they rely on military satellites, for navigation, ATM transactions, and more. “Just as we developed the U.S. Navy to ensure free navigation of the seas, we need a military organization to ensure free navigation of the stars,” he said. Shanahan also tried to downplay the Space Force’s price tag, which is estimated to be $500 million per year by 2024, by saying the new service will cost every American just $1.50 per year. Shanahan cited China “deploying directed energy weapons, and we expect them to field a ground-based laser system aimed at low-earth orbit space sensors by next year. They are also prepared to use cyberattacks against our space systems, and have deployed an operational ground-based [anti-satellite] missile system.” He also pointed to Russia’s development of anti-satellite weapons. Defense officials argued the United States must get organized before a catastrophic event occurs. A senior defense official tried to distance the Space Force from Trump, who first called for the new branch of the military about a year ago. The official noted that Congress had been asking the Pentagon to explore ways to reorganize its space activities, while the House passed legislation two years ago calling for a Space Corps, which is similar to the administration’s Space Force proposal. While some lawmakers and their staffs have been skeptical of the need for a new service, they have championed the need to reorganize the military’s space activities, which are largely centered in the Air Force, but also within the Army and Navy. House Armed Services Committee Chairman Adam Smith has rejected Trump’s Space Force proposal, saying that his committee will come up with its own plan.